Home > Car Care > When does a starter motor need to be replaced? The function of the starter motor is to turn over your engine to start it. With the exception of electric cars and some hybrids, every car has a starter motor. How does it work? 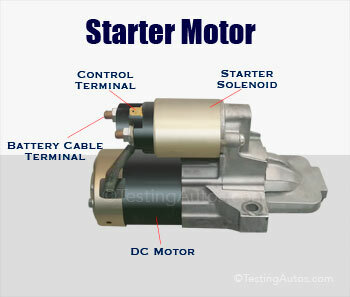 A starter motor is a strong DC (direct current) electric motor powered by the car battery. 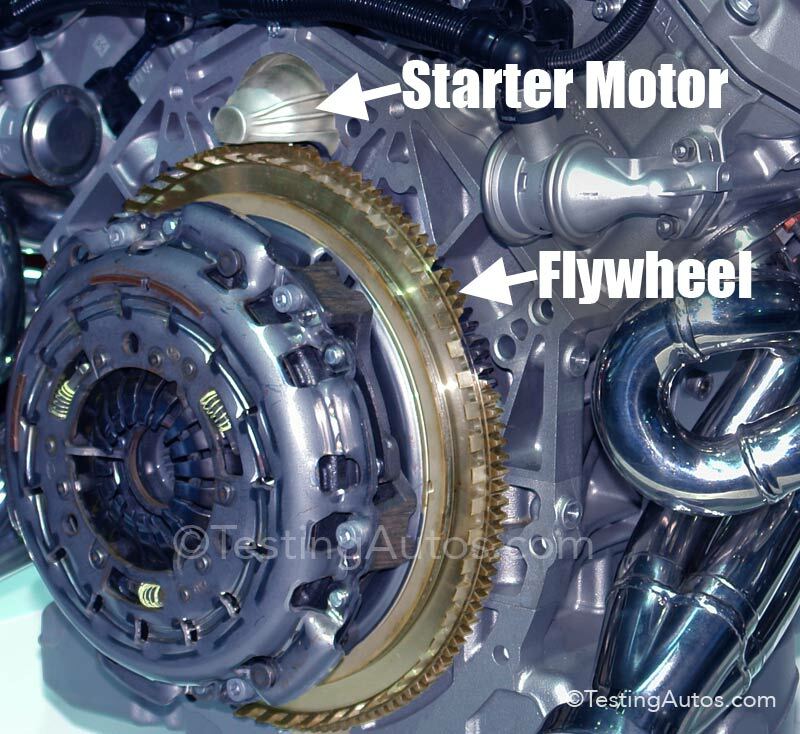 When you press the Start button or turn the ignition key to start, the starter motor engages with the flexplate (automatic) or a flywheel (manual) and turns it over. 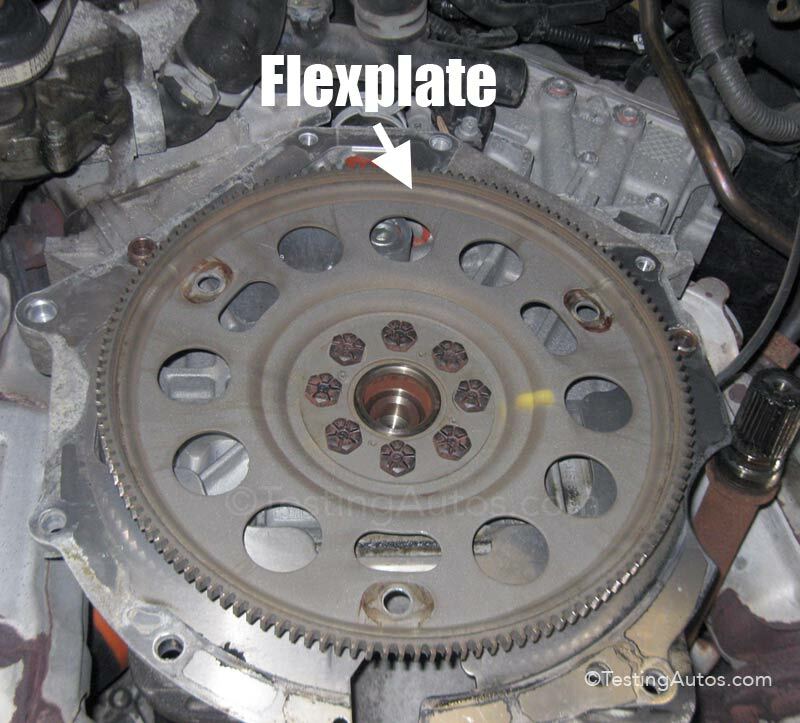 The flexplate is connected to the engine crankshaft, see the photo. A starter motor doesn't require any maintenance. It only needs to be replaced if it fails. How long does the starter motor last? In many cars, a starter motor lasts for the lifetime of the vehicle, but in some cases it may fail in as little as 30,000 miles. Why does it fail? 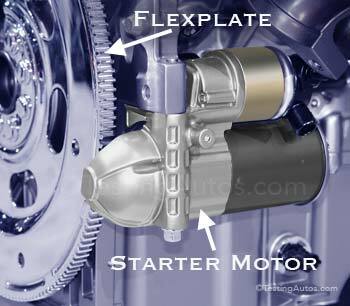 The starter motor has moving and rotating parts. Similar to any other mechanical component, it wears out. What happens if a starter motor fails? You guessed it right; the engine won't turn over. Of course, a failed starter motor is not the only reason why an engine would not turn over. This also could be caused by a weak battery and several other problems. Read: Signs of a weak battery. Are there any signs that the starter motor is failing? Yes, but not always; sometimes a starter motor just quits one day. In some cars when the starter motor is failing, you may notice that the engine won't turn over on the first attempt; it may take several tries before the starter motor engages. Sometimes a worn-out or shorted starter may crank very slow even if the battery is fully charged or new. If a starter motor gear does not mesh properly with the flexplate gear, a start motor may produce a loud grinding noise. In this case, both the starter motor and the flexplate (or flywheel in a manual transmission) ring gear must be inspected. Beside a bad starter motor, this could be caused by worn-out flexplate or flywheel gear teeth. Replacing a flexplate or a flywheel is expensive, as in either case, the transmission must be removed. How do mechanics test a starter motor? The old-day trick was to tap a starter motor lightly with a small hammer and see if it works after that. If it did, the mechanic would know the starter motor is bad. Today, mechanics simply measure the voltage at the starter motor terminals. 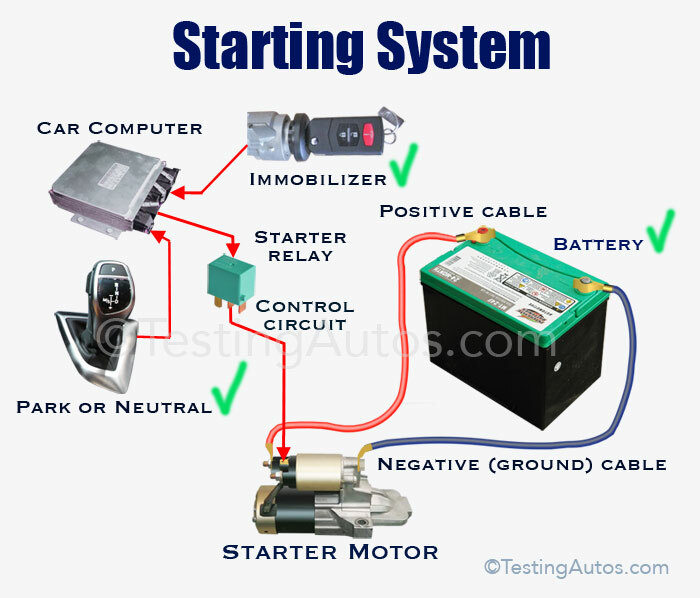 A starter motor has a smaller control circuit wire and a larger battery cable connected to it, see the photo above and this diagram. If there is a battery voltage at both terminals when pressing the Start button or turning the key and the starter motor doesn't run, it's bad. How much does it cost to replace a starter motor? In an average front-wheel drive car like Honda Accord or Toyota Corolla, the labor charge to replace a starter motor varies between $95 and $175. In some vehicles with large engines (e.g. BMW, Cadillac Northstar V8, Toyota V8), an intake manifold or other components must be removed to get to the starter motor and that requires a lot more labor ($260-$450). An aftermarket starter motor (part) costs $85-$220 plus the core charge. The core charge is a deposit for an old part. Many part stores will offer the core charge refund If you return an old starter motor. An original or OEM starter motor is more expensive ($270-$480). For example, our friend Nick decided to be proactive replace the starter motor in his 2014 Honda Accord when it started giving him intermittent problems. He paid $390 for an original part plus $127 labor at the dealership. Can a repair shop rebuild the starter motor? Yes, any local auto electric (Starter & Alternator) shop should be able to rebuild a starter motor. Prices range from $65 to $150 (not including installation).